Kitty cats, if we have learned just one thing from the charming Coco Chanel during our short years on earth, it is that chain detailing can change your life. It is that minute morsel of need-to-know information that will forever keep you large and in charge in the world of fashion; an embellishment that makes you sparkle even if your perkily-polished fingertips are sans oversized bling, or your swanlike neck is barren as opposed to displaying a beauteous bauble dangling from your throat. But I digress; it is not just the upper part of one’s form that should be covered in chain trim; the lower half can benefit just as much from such a decoration…case in point, one’s tantalizing tootsies when encased in Christian Louboutin’s Macarena Wedges! My loves, he may be best-known for his basic black patent leather stilettos displaying a sole the color of the cherry red convertible indulged in when one is suffering from a midlife crisis; but it should come as no surprise that Mr. Louboutin himself is quite talented when it comes to creating a stop-them-dead-in-their-tracks wedge aesthetic, as well. The Macarena Wedges are no different. 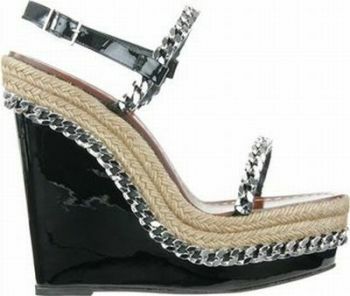 A slick black patent wedge heel of almost six-inches is made edgy via a thick, bold silver chain link that snakes around the entire upper body of the shoe, ending in a nautical-inspired rope-wrapped espadrille footbed which cushions ones pedicured paws, making them wearable for long hours of shopping with the ladies, or comfortable enough to dance the Macarena until the break of dawn; while black patent leather straps, spruced up with matching chain details, coil around the ankle and toes to keep the foot properly in place, and offer optimal comfort. Now if only the asking price were as cushy as the creative design. At $625.00, one cannot really expect to have the funds required to scoop up Louboutin’s saucy style; nevertheless, the aesthetic is achievable in the form of Spiegel’s Chain Wedge Sandal. Though lacking the scrummy red velvet cupcake colored sole of the Macarena Wedges, and serving up a slight differentiation in terms of straps; at $64.00 a pair, Spiegel’s Chain Wedge Sandal is just as stunning as Louboutin’s seductresses, and at a price that is far friendlier to the recessionista fashionista! Thanks to Saks Fifth Avenue and Spiegel for the pictures. I gotta say I like the Louboutin better BUT both are cute. So stunning! Spiegel's version is the one! What a find! I think I actually like Spiegel's version best. wow amazing find. yes Spiegel's are gorgeous! If there's no red sole...what's the point of paying for CL's?? Wow. I absolutely love the chain detail. The Spiegel's look almost identical...so I guess you gotta go with them, right? Gorgeous shoes! I love the patent of the CL, but other than that, I wouldn't choose it over the Spiegel version. I really like the chain detail on both! I couldn't wear them. I am not that talented. I really like them both but I am loving the Spiegals more, they just look a little less "high maintenance" lol. I love these posts, I really want to go shoe shopping now! Wow!! Great find, they are almost identical! I think I like the Spiegel's better - not really digging the patent leather or whatever that is on the Loubies. I like the Spiegel version better... the design is more foot friendly. OOOOh those are lovely!!! I love chain detailing. What a great find! Ah, you are just fabulous as always. I also love zipper detailing. Ooooooh see . . . normally I'm all about your bargains, but there is just nothing like Louboutin . . . my very favorite shoes in the world! While I don't have $625 to spend on them (cheap-ish for Louboutins! ), I don't think I could bring myself to purchase the imitation. Too much love for the real thing! The Louboutin ones are amazing! They are so pretty. I know they're expensive, but I choose them!! I love Louboutin, but I could never afford those wedges! I might feel a little safer in the spiegals, actually. But those are so cool. I have no idea how you ever manage to find such great steals, my love. I definitely prefer the louboutin version though i could never afford it. Oooh... so I would have to chose between a red sole and a one without? That is so hard! I love the signature red sole but I love the cheaper wedge just the same- it would go with everything! Oh wow. I soo want some wedges for the Summer. The wedges are sooo similar! omg i looove knockoffs :) I'd rather buy the cheaper ones for sure ! Cheap ones for sure, but either way they are killer shoes, very unique! hello! hope youre having a great week so far. i like your looks for less- these particular ones dont tickle my fancy that much-mostly because i cant walk in that high heels-- even if its wedges..but i think the look for less is the better one here. btw. yes she totally is like a mix of edie and sienna that france gall- nice observation. WTF you always find the best matches!!! This is one of your best... I'd be totally happy with either pair, they're both super hot! I don't really love either, but they really are so close! For $64 I'd go with Spiegel! I actually love the added straps! Love the Louboutin - but the Spiegel is damn close and agreat price! These are definitely a little more edgy than my usual style.. but thats not such a bad thing! Thrifty for me though! Oh, how interesting. I actually like the more (ridiculously) expensive pair best! I think it just looks shinier and more defined...but yeah, definitely not worth the price. :P The inexpensive version is pretty cute too though! Holy crap these are like exactly the same and i like the extra straps in the Spiegal ones more!! Wow, that is incredible. I actually like the Spiegel version better, but they are practically identical. I'd so love to wear those, but I don't know if I'd be comfortable in them. Really, like the cheaper version just as much as the expensive one. omg, they are exactly the same!!!! i really can't tell the difference so i would go with tightwad! I would LOVE to spend, spend, spend however, true to form, I'm going to take the tight route more and declare the Spiegel's to be FABULOUS! They're cute and looking like they'd be perfect for a Sunday stroll. Wow... I like the Spiegal ones more! Big love for Louboutin but the patent of the wedge seems a little bit trashy to be honest! wow, love those shoes! I actually prefer the cheapo/copycat pair... is that wrong? haha! the spiegel version looks more gorgeous actually ! more details :) plus what better prize could you get from the spiegel one ! Another identical find! I actually prefer the Spiegel one as well. I think it's more subdued (in a good way!) compared to the CL. Amazing find!! I love chains... mmm. Erika, you always find the most perfect items. In this case, I actually think I like the Spiegel's version more. And it's only $64? Who could resist?! Today I received my first pair of Christian louboutin bibi pumps .from http://www.popstyleshos.com , so beautiful !